Pine nuts are the edible nuts from pine trees, which derive from the family Pinaceae and the genus Pinus. These less common varieties of nut are also called pignoli. Pine nuts are loaded with nutrition, including iron, manganese, magnesium, zinc, vitamin E, and vitamin K. As a result, there are several pine nuts benefits. For instance, research suggests that the pine nut improves vision, maintains weight stability, lowers bad cholesterol, and benefits bone strength. It can also potentially reduce the risk of heart attack and boost energy levels. There are about 20 species of pine trees that produce edible pine nuts. The most popular come from four pine trees, including the Italian stone pine (Pinus pinea), the Colorado pinyon (Pinus edulis), the Mexican pinyon (Pinus cembroides), and the Korean or Chinese nut pine (Pinus koraiensis). It will take between 15 to 25 years for pine trees to begin producing pine nuts, and about three times that time for the trees to reach ideal production. Most of the time, these nuts are harvested by hand, which contributes to the expensive price of pine nuts. Pine nuts are small, elongated, ivory-colored nuts that are about half an inch long. When eaten raw, they have a soft texture and a buttery, savory, and sweet flavor. You can lightly toast them to add some crunch and bring out their flavor. This delicious teardrop-shaped nut is a common ingredient in pesto, salads, or desserts. 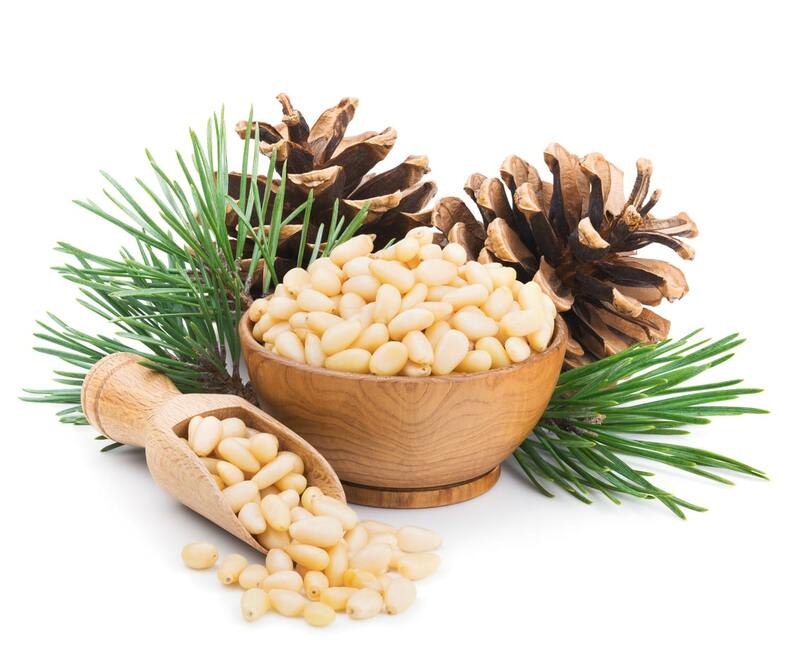 In this article, we will further explain the health benefits of pine nuts. You will also learn about pine nuts nutrition facts as well as the side effects of pine nuts, like a pine nut allergy. What are the central pine nuts nutrition facts? For starters, just a cup of pine nuts contains 594% of your recommended daily value of manganese. It also contains an incredibly high amount of copper, zinc, magnesium, phosphorus, vitamin E, and vitamin K.
Other key nutrients in pine nuts include potassium, calcium, selenium, vitamin A, vitamin C, vitamin B1, vitamin B2, vitamin B3, vitamin B5, vitamin B6, folate, choline, and betaine. The following is a comprehensive pine nuts nutrition chart for one cup, or 135 g, of pine nuts. What are the key pine nuts benefits you need to know? In this section, we will detail how a diet rich in pine nuts lowers bad cholesterol, reduces heart disease risk, maintains a healthy weight, supports bone health, improves vision, boosts energy, and reduces the risk of cancer. We will also take a deeper look at the benefits of key nutrients in pine nuts, including vitamin E, vitamin K, manganese, zinc, iron, and magnesium. Low-density lipoprotein (LDL) cholesterol is also called the “bad” cholesterol. LDL cholesterol carries cholesterol from the liver to the body’s cells, and this cholesterol type is often susceptible to oxidation and inflammation of the arteries. Poor levels of bad cholesterol will also increase your risk of stroke and heart attack. High levels of cholesterol can be easily regulated with a healthy diet that includes pine nuts. The pinolenic acid in pine nuts helps reduce levels of LDL cholesterol. A 2015 study found that LDL cholesterol levels had been lowered when pine nuts were introduced to the diets of rabbits with high cholesterol. Pine nuts have also been proven to prevent atherosclerosis—a condition that involves plaque buildup in arterial blood vessels. A six-week-long 2014 study also found that pine nuts improved cholesterol lipid levels in women with metabolic syndrome—a condition that includes high cholesterol, high blood sugar, high blood pressure, and excess body fat on the waist. In general, pine nuts can help reduce the risk of heart disease. The monounsaturated fat, manganese, magnesium, vitamin E, and vitamin K in pine nuts are nutrients that are all known to promote heart health. Research published in the journal Archives of Internal Medicine (now known as JAMA Internal Medicine) in 2002 found that pine nuts can reduce the risk of death from a heart attack. Heart diseases are known to lead to arterial plaque buildup such as coronary atherosclerosis, which can lead to stroke and heart attacks. The magnesium in pine nuts also lowers blood pressure, which can additionally reduce your risk for heart failure. There is a lot of vitamin K in pine nuts. It is important to note that vitamin K is as essential to building bones as calcium. If your body is deficient in vitamin K, you could be at risk for weak bones and osteoporosis. Research shows that women and men with high levels of vitamin K2 are 65% less likely to suffer from hip and bone fractures when compared to people with low levels of vitamin K2. A study published in the American Journal of Health-System Pharmacy in 2005 found that vitamin K may prevent and treat osteoporosis. Researchers noted that vitamin K not only reduces fracture rates, but it also increases bone mineral density. One of the most common causes of vitamin K deficiency is cholesterol-lowering drugs, which may not be necessary if you consume a healthy, well-balanced diet that includes cholesterol-reducing foods like pine nuts. Pine nuts also contain the carotenoid lutein, and this nutrient improves vision and helps prevent eye diseases like glaucoma and age-related macular degeneration (AMD). The macula is a small area found at the back of the eye and in the middle part of the retina. As AMD progresses, blood vessels will leak fluid and blood in your retina, and this causes further eye damage. Lutein benefits vision by fighting free radical damage caused by sun exposure, blue light, and other factors like a poor diet. Some research shows that people with macular damage can reduce added damage by introducing more lutein-rich foods into the diet, including pine nuts. Pine nuts contain fatty acids that help suppress your appetite, and this can help with weight loss and metabolism. Fatty acids in pine nuts like pinolenic acid release a hormone called cholecystokinin (CCK)—a known appetite suppressor. A study published in Nutrition Journal in 2015 found that people who consume pine nuts on a regular basis have a smaller waist circumference, a lower average weight, and a low level of insulin resistance—all factors that contribute to healthy weight loss. Pine nuts also contain certain nutrients that boost your energy levels. Pine nuts are a good source of fatigue-reducing nutrients such as iron, magnesium, protein, and monounsaturated fat. These will help you boost energy levels without leading to a burnout later in your day. The magnesium in pine nuts may also reduce your risk of certain cancers, including pancreatic cancer and colorectal cancer. A study that followed nearly 67,000 men and women, published in the British Journal of Cancer in 2015, found that a magnesium deficiency of 100 mg per day had led to a 24% higher risk of pancreatic cancer. Another 2015 study published in the journal Cancer Causes & Control found that consuming 400 mg of magnesium daily had been effective for the prevention of colorectal cancer in postmenopausal women. For this study, an increased magnesium intake had led to a lower instance of colorectal cancer. Eating pine nuts especially improves vitamins E and K dietary intake. The above nutrition chart notes that a cup of pine nuts contains 91% of the recommended daily intake of vitamin K, and 63% of the daily value of vitamin E.
Vitamin K and vitamin E both have beneficial effects on heart health. Vitamin E helps the body produce red blood cells, which are needed for oxygen transportation. Vitamin K is used to prevent blood clotting and promotes the calcification of bones rather than blood vessels. In fact, pine nuts and cashews are the only two tree nuts with any significant amount of vitamin K.
Pine nuts are also very high in manganese and zinc. A cup of pine nuts contains a whopping 594% of the recommended daily value of manganese and 58% of the recommended intake of zinc. Zinc is valued for its immune-boosting and wound-healing abilities, while manganese is essential for strengthening connective tissue and maintaining the body’s hormonal balance. Pine nut consumption also improves magnesium and iron levels required from your diet. A cup of pine nuts contains 41% of the recommended daily intake of iron, and 85% of your recommended daily amount of magnesium. Magnesium is essential for weight loss, lowering blood pressure, helping to prevent cancer, reducing fatigue, and stabilizing mood. Iron also reduces fatigue and improves muscle and brain function. Are there any side effects of pine nuts? Like all nuts, pine nuts have been known to cause an allergic reaction that is often an anaphylactic response, like difficulty breathing, vomiting, diarrhea, and abdominal pain. Less severe symptoms include skin itching. Therefore, if you are allergic to tree nuts in general, be sure to avoid pine nuts. A less common pine nut allergy is pine mouth syndrome (PMS), which leads to a bitter or metallic taste disturbance in your mouth a few days after eating pine nuts. This condition may last for up to week. To stop pine mouth syndrome, simply discontinue consumption of pine nuts. Although pine nuts are one of the more expensive tree nuts, they are worth adding to your regular diet since they are loaded with nutrition and health benefits. Pine nuts are great in traditional pesto; added to salads, cookies, and other desserts; or roasted in the oven and enjoyed as a snack. Nutrients found in pine nuts include manganese, iron, zinc, magnesium, vitamin E, and vitamin K. Consequently, pine nuts benefits include lowering cholesterol, reducing heart disease risk, improving bone strength, improving vision, helping weight management, boosting energy, and lowering the risk of certain cancers like pancreatic cancer and colorectal cancer. That being said, you will need to avoid pine nuts when you have an allergy to tree nuts. “Nuts, pine nuts, dried Nutrition Facts & Calories,” SELFNutritionData; https://nutritiondata.self.com/facts/nut-and-seed-products/3133/2, last accessed October 9, 2018. Huseini, H., et al., “Anti-hyperlipidemic and anti-atherosclerotic effects of Pinus eldarica Medw. Nut in hypercholesterolemic rabbits,” Daru, June 2015; 23: 32, doi: 10.1186/s40199-015-0114-9. Lee, Y., et al., “Nut consumption has favorable effects on lipid profiles of Korean women with metabolic syndrome, “Nutrition Research, Sept. 2014; 34(9): 814-820, doi: 10.1016/j.nutres.2014.08.011. Albert, C., et al., “Nut consumption and decreased risk of sudden cardiac death in the Physicians’ Health Study,” Archives of Internal Medicine, June 2002; 162(12): 1382-1387, PMID: 12076237. Adams, J., et al., “Vitamin K in the treatment and prevention of osteoporosis and arterial calcification,” American Journal of Health-System Pharmacy, Aug. 2005; 62(15): 1574-1581, doi: 10.2146/ajhp040357. O’Neil, C., et al., “Tree Nut consumption is associated with better adiposity measures and cardiovascular and metabolic syndrome health risk factors in U.S. Adults: NHANES 2005-2010,” Nutrition Journal, June 2015; 14: 64, doi: 10.1186/s12937-015-0052-x. Dibaba, D., et al., “Magnesium intake and incidence of pancreatic cancer: the VITamins and Lifestyle study,” British Journal of Cancer, Dec. 2015; 113(11): 1615-1621, doi: 10.1038/bjc.2015.382. Gorczyca, A., et al., “Association between magnesium intake and risk of colorectal cancer among postmenopausal women,” Cancer Causes & Control, Dec. 2015; 26(12): 1761-1769, doi: 10.1007/s10552-015-0669-2. “Pine nuts nutrition facts,” Nutrition and You; https://www.nutrition-and-you.com/pine-nuts.html, last accessed October 9, 2018.